The heavy-duty, concentrated formula cleans and degreases without the harsh solvents found in other commonly used products. The non-flammable, non-abrasive, non-corrosive and biodegradable formula provides a safer alternative for employees, equipment and the environment. It easily cuts through the heavy oils, grease and drill muds found in the petroleum industry, helping to keep equipment and vehicles running at optimum levels. It allows for grease and oil to break back out of the solution, making it ideal for entry into oil/water separators and clarifier equipment. For use in on and off-shore drilling rigs, the powerful cleaner eliminates built-up grime and residue on pumps, pads and jacks, platforms, decks, derricks, liners, casings, crown and traveling blocks and blowout preventers. It can also be used to maintain vehicles, equipment, engines and generators. 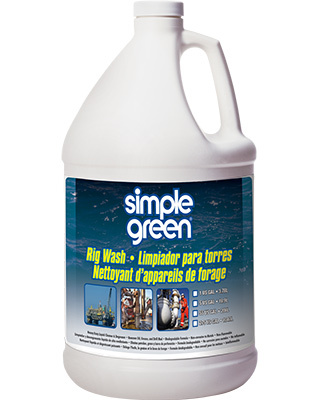 Simple Green Rig Wash removes the heavy oils, grease and drill muds found in the petroleum industry. Use in both on and off-shore drill rig settings. Cleans drilling rigs, pumps, jacks, pads, platforms, decks, oil wells, vehicles and equipment.